I’ve experimented over the years with various cakes, cookies, and tiny pies to eat while on long trail runs (the Feed Zone Portables book is ACE for this! ), but these give more of a slow release burn rather than a sharp uptake in energy needed for racing, so I’d begrudgingly gone back to gels (my favourites being Torq and Shot Bloks, which my stomach tolerates just fine). I ran into a friend of mine, Lauren, after London marathon and she was telling me about the homemade flax gels she’d made to get her through the race and that they actually gave her a boost, so I was intrigued enough to give it a try myself. To make: mash up the banana in a bowl with a fork until it’s no longer chunky. Add all the dry ingredients and the honey, and stir together. Add boiling water to the mix, stir well, and let cool. Note that both the flax and chia will naturally make it thicken, so you probably want to make it runnier than you’d expect. The above fills 4-5 of the below pouches, so is plenty enough for a few runs. I took the gels out on a few trail runs and I loved the taste – like delicious porridge from my childhood! The gels also gave me a definite boost after I ate them, too, which is fantastic. The only downside was that they were hard to transport – Lauren said she had hers in a ziploc bag she just sort of squeezed into her mouth, but I tried a little tupperware, which I then out to scoop out with my finger. Not great. 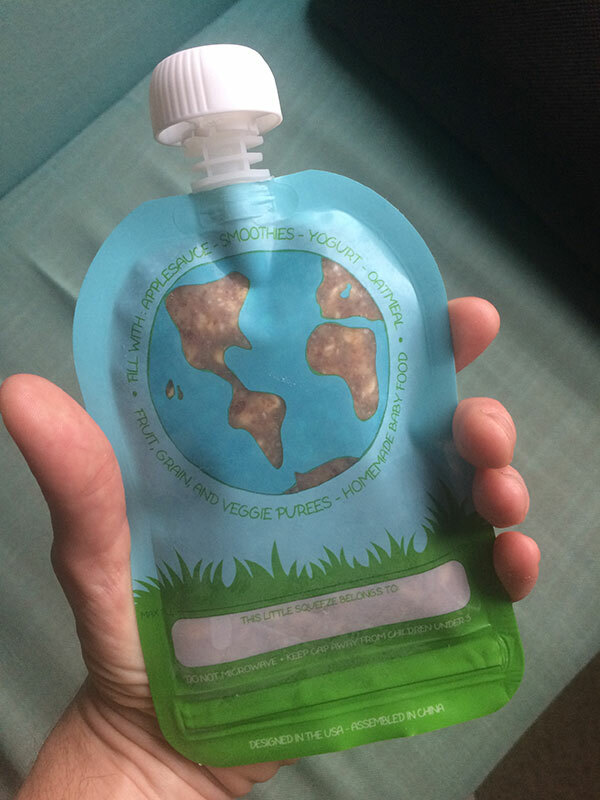 But then someone suggested reusable baby food pouches! Not having any children, I literally didn’t know these existed, but they’re brilliant – double ziploc opening on the bottom to spoon the goo in, seal it up, and then you’ve got a secure cap and sucky straw at the top. They’re freezable and dishwasher safe. Even the smallest, 100ml ones are a bit bigger than an iPhone 6+, though, which means they’re a tad awkward to fit into shorts pockets (though fine in backpacks) and of course you need to carry the empties with you rather than bin them along the run, but I’m really happy with this new nutrition strategy for Transylvania now!